To a generation of Montreal Canadiens fans those two sentences, spoken by legendary play-by-play man Bob Cole on CBC’s Hockey Night in Canada, will forever live on in our memories. I can recall that fateful night in early June of 1993 like it was yesterday. In fact, that whole spring feels so close, yet so far away. I was still new to the sport of hockey, having really only been watching on TV, collecting trading cards, for only a year or so. Little did my eight year old self realize that what I was watching was going to shape my life for the foreseeable future. Those two months in the spring of 1993 solidified my lifelong romance and membership in the religion known as Le Club de Hockey Canadien. It’s not a cliché to say that hockey in Montreal is a religion. No other team in the sport can compare with the Canadiens’ history – being the oldest franchise in the NHL (the Habs, in fact, predate the league’s founding by nearly 10 years! ), and having captured the most Stanley Cup championships, tends to do that. Truth be told, the Habs have always had a religious aura about them. They wear a uniform nicknamed La Sainte-Flanelle (The Holy Sweater), Guy Lafleur was known as Le Demon Blond, Patrick Roy will forever be revered as St. Patrick, plus many other examples. The religious overtones of the franchise are one of the big reasons why 25 years later the 1993 Cup winning team has taken on an almost mythical status in Habs fans’ minds. 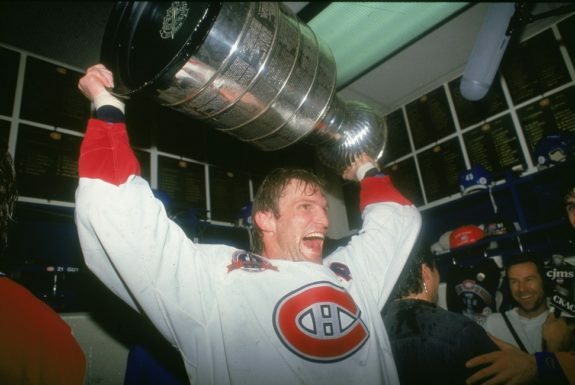 This past June marked the 25th anniversary of the Canadiens’ last Stanley Cup. An improbable run when the playoffs began that April but culminating with an unfathomable record 10 straight overtime victories along the way to the Stanley Cup. Improbable because the Canadiens only won four of their final ten games during the regular season (Patrick Roy personally lost his final five games as well) and could not have been colder going into the first round. Things went from bad to worse quickly in the playoffs with the Canadiens losing the first two games of their opening-round series to the hated provincial rival Nordiques in Quebec before winning game three in overtime at the Forum and going on to take the best-of-seven series in six games. The Habs then swept my hometown Buffalo Sabres in the second round, winning the last three games of the series in overtime. I can vividly recall watching these games either in the basement of my Dad’s house or upstairs in my bedroom on an old 13-inch black & white TV, falling asleep while watching my ‘heroes’ conquer another foe. The series victory over the Sabres set up the Canadiens versus the New York Islanders, themselves a Cinderella team after previously dispatching the defending champion Pittsburgh Penguins, in the Prince of Wales Conference Final (now known as the Eastern Conference Final). The Habs eliminated the Islanders in five games — winning two more overtime games — to advance to the Stanley Cup Final. 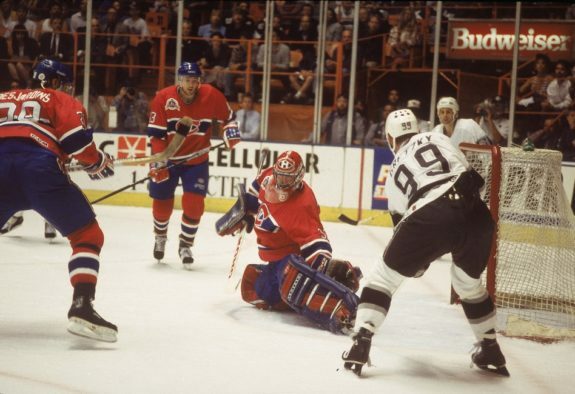 Wayne Gretzky’s Los Angeles Kings came in hot after a hard-fought seven-game series with the Toronto Maple Leafs and easily won game one of the Cup final 4-1 at the Montreal Forum. As many know the series and hockey history itself changed in game two with the infamous Marty McSorley stick measurement. The turning point in the Cup final came in game two with the Canadiens trailing 2-1 and just 1:45 left in the third period when Canadiens head coach Jacques Demers, on the advice of captain Guy Carbonneau, called for a measurement on Kings player Marty McSorley’s stick, which had an illegal curve. After some tense moments of measuring the stick (and the unforgettable glare of Kings coach Barry Melrose) referee Kerry Fraser sent McSorley to the penalty box for using an illegal stick and Demers pulled Roy for a two-man advantage. The Habs took advantage as Eric Desjardins scored on the power play and then added the game-winning goal just 51 seconds into overtime, capping a hat trick. In fact, Desjardins is still the only defenseman in NHL history to record a hat trick in a Stanley Cup Final. This gave the Canadiens an improbable 3-2 win that sent the series to Hollywood all even at a game apiece. It was the eighth consecutive overtime win for Montreal. The Canadiens won both games three and four in overtime and then clinched their 24th Stanley Cup with a 4-1 victory in game five. I can still recall my silent cheering so not to wake up anybody in my house as I watched on the couch. So thank you Patrick Roy, Guy Carbonneau, Vincent Damphousse, Kirk Muller, Brian Bellows, Mike Keane, Eric Desjardins, Paul DiPietro, Gilbert Dionne, John LeClair, Benoit Brunet, Kevin Haller, Stephan Lebeau, Lyle Odelein, Ed Ronan, Denis Savard, JJ Daigneault, Patrice Brisebois, Gary Leeman, Mathieu Schneider, Jesse Belanger, Donald Dufresne, Todd Ewan, Sean Hill, Oleg Petrov, Andre Racicot, Rob Ramage, and Mario Roberge. Names that will forever be etched into the memory of this and an entire generation of Montreal Canadiens fans. Many of the current members of the Canadiens have little or no memory of the last time there was a Stanley Cup parade in the city they now call home for most of the calendar year. Carey Price was still two months away from his sixth birthday in August of 1993. Brendan Gallagher had only celebrated his first birthday a month earlier in May, while current Habs captain Shea Weber was the ripe, old age of seven. Heck, Jonathan Drouin, Jesperi Kotkaniemi, Artturi Lehkonen, and Victor Mete were not even born. 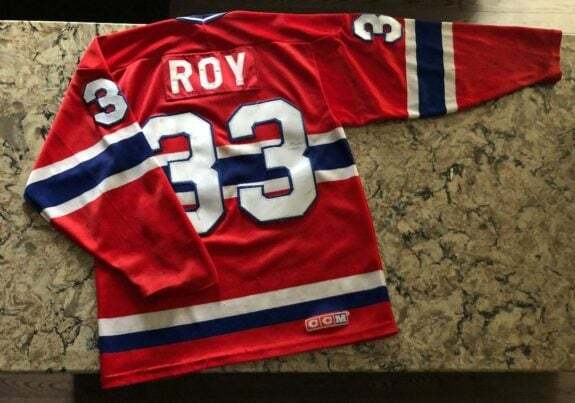 With the team’s subsequent trade of Patrick Roy and their mid-late 90s decline, there is now an entire generation of Habs fans who have no idea what it means to win Lord Stanley’s Cup. Sure, there’s YouTube or NHL.tv to watch the highlights on-demand 24/7, but it’s not the same. Nothing can ever replicate that feeling of watching it live as a wide-eyed eight-year-old – not a care in the world that spring except what was going on with my beloved Canadiens.